Remember, you’re interviewing them just as much as they’re interviewing you. You nod and smile, because you’re pretty sure you’re supposed to know what this means—but in reality, you have no idea. After all, you aren’t planning to lead with “Tell me about yourself,” or end by laying out a timeline for next steps. Before the interview, the hiring manager reviews your resume. The in-person meeting is a follow-up where they make sure you’re not just perfect on paper, but someone they’d want to work with in real life. Similarly, you’ll do your research on a company. Think of this as your chance to see if it matches what you’ve learned so far. For example, if you’ve read the culture is people-centered and collaborative, look to see if colleagues appear to be interacting in the hallways or conference rooms, or if everyone’s wearing headphones. Additionally, just a like a hiring manager would mentally deduct points if you were late (or rude), you’ll do the same. Do they keep moving your interview around? Make you wait an hour in the lobby? Do you just get a gut feeling this isn’t the place for you? These are all red flags. 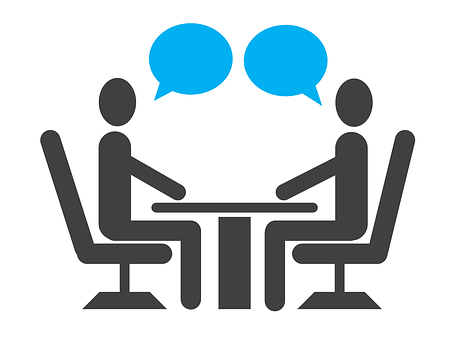 Hiring managers use the interview to clarify any lingering questions from your application. For example, you may be asked why you’re qualified even though you don’t possess traditional experience, or exactly what your last management role entailed. Oh, and if the hiring manager gives strange answers, that falls into the red flag category, too. The interviewer knows they have something to offer—that would literally be the job. But some people get so swept up in the fact that they’re competing with others that they forget just how awesome they are. They prioritize being the hiring manager’s top choice over assessing if this’ll really be the right position for them. So, you may need a reminder that the company would be lucky to have you! Just like they’d pass over a so-so candidate for a great one, you need to remember that this is not the last interview you’ll ever have in your entire career. Not only will this reminder keep you from ignoring red flags or settling, it’ll also help you avoid acting desperate. At its core, this phrase means the impression the company makes on during your in-person interview should figure into your decision as much as how you present yourself will sway them. So, don’t wait until you’re extended an offer to think about what it’d really be like to work there. Tune into your feelings on interview day, too. “Here’s What “You’re Interviewing Them As Much As They’re Interviewing You” Actually Means” was originally published on The Muse. Sara McCord is a Staff Writer/Editor for The Muse.